Iliamna Volcano is a 3,053-meter-high, ice- and snow-covered stratovolcano in the southwestern Cook Inlet region about 225 kilometers southwest of Anchorage and about 100 kilometers northwest of Homer. Historical eruptions of Iliamna Volcano have not been positively documented; however, the volcano regularly emits steam and gas, and small, shallow earthquakes are often detected beneath the summit area. The most recent eruptions of the volcano occurred about 300 years ago, and possibly as recently as 90-140 years ago. Prehistoric eruptions have generated plumes of volcanic ash, pyroclastic flows, and lahars that extended to the volcano flanks and beyond. Rock avalanches from the summit area have occurred numerous times in the past. These avalanches flowed several kilometers down the flanks and at least two large avalanches transformed to cohesive lahars. The number and distribution of known volcanic ash deposits from Iliamna Volcano indicate that volcanic ash clouds from prehistoric eruptions were significantly less voluminous and probably less common relative to ash clouds generated by eruptions of other Cook Inlet volcanoes. Plumes of volcanic ash from Iliamna Volcano would be a major hazard to jet aircraft using Anchorage International Airport and other local airports, and depending on wind direction, could drift at least as far as the Kenai Peninsula and beyond. Ashfall from future eruptions could disrupt oil and gas operations and shipping activities in Cook Inlet. Because Iliamna Volcano has not erupted for several hundred years, a future eruption could involve significant amounts of ice and snow that could lead to the formation of large lahars and downstream flooding. The greatest hazards in order of importance are described below and shown on plate 1. 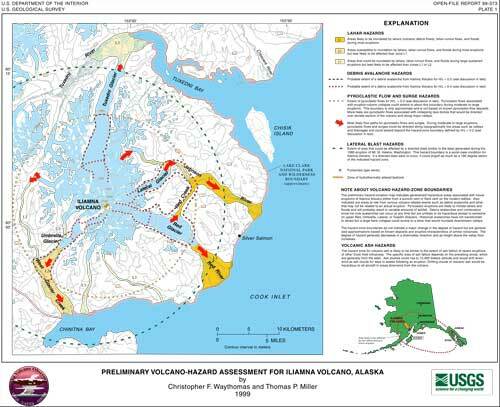 Waythomas, Christopher F., Miller, Thomas P., 1999, Preliminary Volcano-Hazard Assessment for Iliamna Volcano, Alaska: U. S. Geological Survey Open-File Report 99-373, 31 pp., https://pubs.usgs.gov/of/1999/0373/.